A bronze water dropper in the form of a buffalo, depicted in standing position. The animal turns its head slightly toward the left. The horns curve backward, the pointed ears, bulging eyes, dewlap, hooves and bushy tail are well defined. An aperture is positioned in the middle of the animal’s back to allow water to be poured into the hollow body, whilst a small opening that acts as a spout is in the middle of its mouth. The water dropper has acquired a beautiful, dark chocolate patina. The buffalo is preserved within an old Japanese wooden box. This finely cast bronze piece is very rare, both for the quality of the casting and for the naturalistic depiction of the animal, resembling a miniature sculpture. It would have been used as a water dropper for adding water to freshly ground ink, and the flow of water could be controlled by placing a finger or thumb on the larger hole on the animal’s back. The buffalo (niu) is one of the twelve animals of the Chinese zodiac and is closely identified with the life of the peasant. It was an important animal in all wet-rice cultivation societies and its depiction dates back thousands of years. 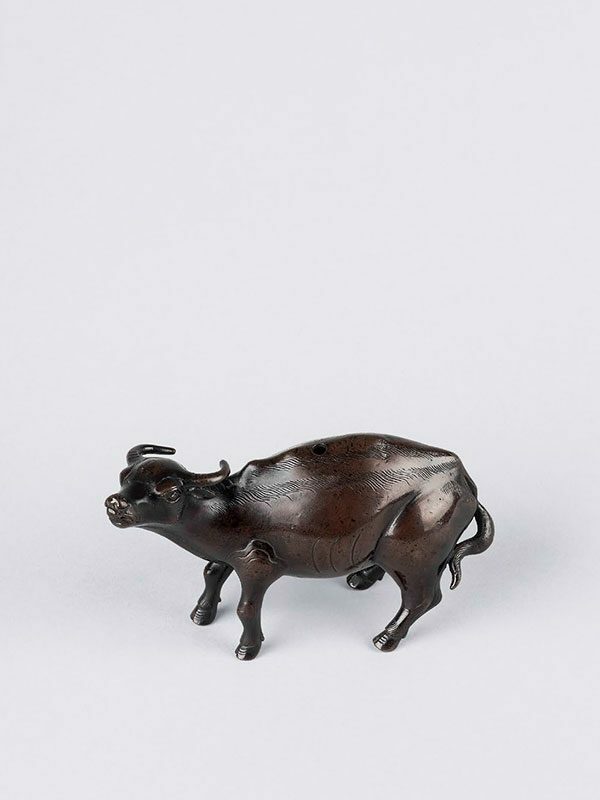 A water dropper of buffalo form, to be placed on a scholar’s desk, may indicate the ideal, simple life far away from the obligations and responsibilities of city or official life. Two comparable reclining bronze water droppers are illustrated in The Second Bronze Age – Later Chinese Metalwork: the first is a smaller buffalo, dated to the Song to Yuan dynasty (12th – 14th century); the other is a parcel gilt bronze piece in the form of a herdboy riding a reclining buffalo, and is dated to the Ming or Qing dynasty, 17th century.